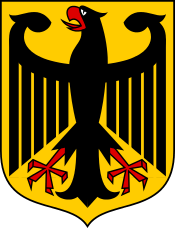 German federal elections took place on 18 September 2005 to elect the members of the 16th German Bundestag, the federal parliament of Germany. They became necessary after a motion of confidence in Chancellor Gerhard Schröder failed on 1 July. Following the defeat of Schröder's Social Democratic Party (SPD) in a state election, Schröder asked his supporters to abstain in the Bundestag motion in order that it fail and thus trigger an early federal election. Chancellor Schröder orchestrated the loss of the Bundestag motion of confidence with the aim of triggering an early federal election following the defeat of his SPD in Germany's most populous state, North Rhine-Westphalia on 22 May 2005. The victory of the CDU in North Rhine-Westphalia gave that party, together with the FDP, a working majority in the Bundesrat, the federal legislature's upper house. Early federal elections in Germany can only take place after the dissolution of the Bundestag by the President of Germany, since the constitution forbids the Bundestag to dissolve itself. The President can dissolve it only after the Chancellor loses a vote on a motion of confidence. The Federal Constitutional Court ruled in a similar situation in 1983 that Chancellors may not ask the President for the Bundestag's dissolution merely for the sake of their desire for an early election; they have to have a real problem getting a majority for his legislation. Many observers agree that Schröder met this requirement, since a number of left-wing SPD delegates had expressed great reservations about Chancellor Schröder's labour reform and welfare reform programme. However, only days before the vote, the coalition had passed a number of bills with no dissenters, indicating strong support for the Chancellor within the coalition. After urging members to abstain on the vote, Chancellor Schröder purposely lost a vote of confidence in the Bundestag on 1 July by 296 to 151. On 21 July President Horst Köhler dissolved the Bundestag and paved the way for the early election on 18 September. The Green member of parliament Werner Schulz – who, in a much-cited speech on the day of the motion of confidence, had criticised the deliberate loss of the motion as "farcical" and likened the Bundestag's obedience to Schröder to behaviour typical of the German Democratic Republic Volkskammer – and the SPD member of parliament Jelena Hoffmann jointly filed a constitutional complaint in the Federal Constitutional Court. The Court rejected the complaint on 25 August, ruling as valid the President's decision to dissolve the Bundestag, thereby giving the green light for the early elections on 18 September and ending speculation that Schröder would have to step down or lead a "lame duck" government. The FDP announced its election program before any other party, publishing it on 24 July. It called for strong saving measures in public spending and more room for local negotiation between employees and employers, as opposed to central control by trade-union officials. The leaders of the left wing Party of Democratic Socialism (the "PDS") agreed to let candidates of the centre left Electoral Alternative for Labor and Social Justice (the "WASG") run on their party list, leaving open the possible future option of a merger between the two parties. In agreeing to this the WASG stipulated that the PDS rename itself as the Left Party. The WASG, with its front-runner Oskar Lafontaine (a former SPD leader), formed from breakaway elements within the SPD, angered at that party taking a "neoliberal" direction in economic reforms. The general membership has already approved this measure and awaits to hear from the PDS party convention to agree as well. 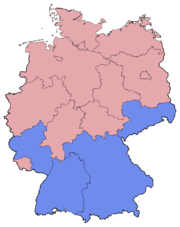 If successful this could lead to a further erosion of the SPD's strength, as the PDS has never made inroads in the former West Germany (it lineally succeeded the former governing communist party (Socialist Unity Party of Germany) of the former German Democratic Republic), while the WASG has its base in western Germany and could garner substantial votes there. In early August support for Angela Merkel declined considerably. Reasons for this included conflicts about the election program in and between the conservative parties (the CDU and the CSU), and arguments with their preferred coalition partner, the FDP, as well as embarrassing gaffes. At one point the media criticized Merkel for confusing net and gross income figures during a campaign speech. Following this, polls suggested that the CDU/CSU and FDP would only win 48% of votes between them, and thus would not be able to form a government. Further damage occurred when two prominent CDU/CSU candidates, Jörg Schönbohm and the CSU leader Edmund Stoiber, made insulting remarks about East Germans. These remarks not only alienated voters in Eastern Germany but also made some question the CDU/CSU's confidence in Merkel, as she herself grew up in the East. However, polls carried out by the Süddeutsche Zeitung in late August showed the CDU/CSU/FDP bloc back up at 51% of the vote. Predictions suggested that the opposing bloc of incumbent Chancellor Gerhard Schröder's ruling Social Democrats, the Greens and the country's recently formed left-wing Left Party (PDS/WASG alliance) would win a combined total of only 46%. The leaders of the SPD and the Greens, Schröder and Fischer, as well as the Left Party's front-runner Gregor Gysi said they opposed the idea of a "red-red-green" coalition. With polls remaining so close, speculation increased that (as in the elections of 1994, 1998 and 2002) a small number of overhang seats might significantly impact the election results. On Sunday 4 September, Schröder and Merkel met in a head-to-head debate which was broadcast by four of Germany's major private and public television networks. Although most commentators gave the initial edge to Merkel, polls soon showed that the general public disagreed and ranked Schröder the clear winner. Later analysis suggested that Merkel's support for a flat-tax proposal by Paul Kirchhof, the shadow Finance Minister, further undermined her credibility on economic affairs and gave the impression that the CDU's economic reforms would only benefit the very rich. Midweek polls showed the SPD clawing their way upwards by a few percentage points although the combined CDU/CSU and FDP votes tended to remain 1 to 2 percentage points ahead of those for the left-wing parties combined. On the eve of the election, the CDU enjoyed a 9% lead over the SPD (42% and 33% respectively), albeit with neither party likely to have enough seats (even with their preferred coalition partners) to form a government. Merkel's personal popularity (consistently below that of her party) had climbed back up to 40%, from a low of 30% while Schröder's had reached a peak of 53% (consistently exceeding that of his party). However, polls also showed that even at this late stage, a quarter of German voters had not yet decided how to vote and that these undecided voters could decide the final result if they turned out to vote. With polls still so close, the parties broke with tradition and continued campaigning on the Saturday before the election and on election day itself. While pundits focused on the likelihood of a grand coalition, the CDU suggested that the SPD might consent to forming a coalition with the new Left Party. Germany went to the polls on 18 September 2005. 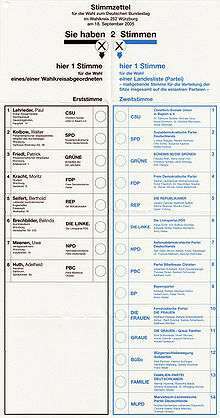 Voters in one constituency in Dresden had to wait until 2 October to vote in order to allow the reprinting of ballot-papers after the death of the National Democratic Party candidate on 8 September. Soon after voting ended, it became clear that the CDU/CSU (the “Union”) had narrowly edged out the SPD. However, neither of the two likely coalitions (SPD-Greens and CDU/CSU-FDP) could achieve a Kanzlermehrheit – the support of the majority of members of the Bundestag required to elect a Chancellor. This meant that Germany had a hung parliament as no coalition could hold an overall parliamentary majority. Exit polls for both the ARD and the ZDF television networks showed the CDU/CSU on 35%, the SPD on 34%, the FDP on 10%, the Left Party on 9% and the Greens on 8%; a Forsa poll differed slightly, predicting 36% for the CDU/CSU and 8% for the Left Party. Early seat projections suggested that the CDU/CSU and the SPD had virtually tied in the count for seats in the Bundestag. The exit polls and projections proved broadly accurate in the preliminary results released on 19 September and in the final results published on 7 October. The SPD/Green coalition's number of seats fell from 306 seats (in a house of 603), to 273 seats (in a house of 614) while the opposition, the CDU/CSU-FDP coalition's number of seats fell from 295 seats to 286 seats. Both potential coalitions fell far short of the 308 seats required for a majority in this Bundestag. The Left Party and the FDP overtook the Greens, previously Germany’s third most-popular party since 1994. The FDP, with almost 10% of the vote, scored its best result since the 1990 federal election, regaining its status as the Federal Republic’s third party, which it had enjoyed throughout the history of West Germany and maintained in the first post-German reunification election. Some analysts believe that the rise in the FDP vote came as a result of tactical voting by CDU-CSU voters hoping to prevent a grand coalition by buttressing the Free Democrats. Of the parties that failed to secure the 5% needed to attain seats in the Bundestag, the National Democratic Party performed best, winning 1.6% of the list vote and 1.8% of the constituency vote. Despite some prominent members publicly blaming Merkel for its poor showing, the CDU/CSU confirmed her as leader on 20 September. On 22 September, SPD members began musing that the political system should consider the CDU and the CSU as separate entities rather than as a single parliamentary faction. In such a scenario, the SPD would be the largest party in the Bundestag and thus, they argued, an SPD member should become Chancellor in any grand coalition. One SPD legislator indicated he planned to introduce a motion in the Bundestag explicitly defining the CDU and the CSU as separate parties. The Greens rejected coalition with the CDU/CSU after talks broke down. The CDU/CSU pressed their case for the Chancellery after victory in the delayed vote in Dresden, and ahead of talks with the SPD; the SPD maintained their own claim, but Schröder indicated that he would step aside if his party wished it. Finally, on 10 October, officials from the CDU/CSU and the SPD announced that negotiations to form a grand coalition had succeeded. Angela Merkel would become Chancellor and the sixteen seats in the new cabinet (including the Chancellery) would go equally to each side, with both the CDU/CSU and the SPD each having eight posts. The SPD would control eight ministries including the important roles of finance and foreign affairs, while the CDU/CSU would control six ministries as well as providing the Chancellor and the Director of the Federal Chancellery (the Chancellor's Chief of Staff), who would also hold the position of Minister for Special Affairs. 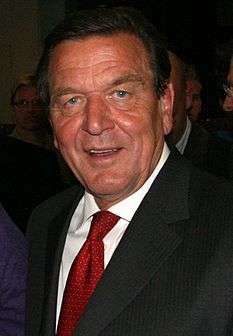 Gerhard Schröder would retire from politics. Detailed negotiations on the formation of the new government continued into November, with Edmund Stoiber of the CSU withdrawing from the proposed cabinet to continue as Minister-president of Bavaria. All three parties held conferences on 14 November which voted to approve the deal. The majority of CDU/CSU and SPD delegates in the newly assembled Bundestag elected Merkel as Chancellor on 22 November. 397 members of the Bundestag voted for Merkel, indicating that 51 members from one or more of the SPD, CDU or CSU do not support the coalition deal. Reports have indicated that the grand coalition would pursue a mix of policies, some of which directly contradict aspects of Merkel's political platform as a former leader of the opposition and candidate for Chancellor. The coalition intended to cut public spending while increasing VAT, social-insurance contributions and the top rate of income tax. Employment protection would no longer cover employees during their first two years in a job, and the new government intended to freeze pensions and to scrap subsidies for first-time home buyers. In the field of foreign policy, Germany would maintain its strong ties with France and with Poland, and will continue its support for Turkey as a future member of the European Union. Merkel has defined the main aim of her government as reducing unemployment, and expressed the hope that posterity will judge the success of her tenure on the basis of this issue. Proksch, Sven-Oliver; Jonathan B. Slapin (May 2006). "Institutions and coalition formation: The German election of 2005". West European Politics. 29 (3): 540–559. doi:10.1080/01402380600619884. Pulzer, Peter (May 2006). 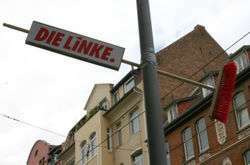 "Germany votes for deadlock: The federal election of 2005". West European Politics. 29 (3): 560–572. doi:10.1080/01402380600620692. ↑ "Merkel boosted by party support". BBC News. 20 September 2005. Retrieved 3 May 2010. 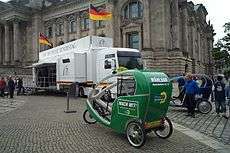 ↑ "German Greens spurn CDU alliance". BBC News. 23 September 2005. Retrieved 3 May 2010. ↑ "German CDU pushes leadership bid". BBC News. 3 October 2005. Retrieved 3 May 2010. ↑ "CNN.com - Schroeder aide is foreign minister - Oct 13, 2005". wayback.archive.org. Retrieved 2016-11-08. ↑ "Merkel named as German chancellor". BBC News. 10 October 2005. Retrieved 3 May 2010. ↑ "Business & Financial News". Reuters. 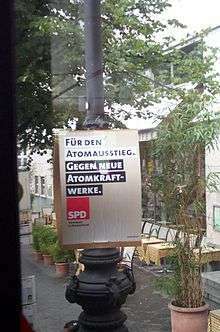 ↑ "German parties back new coalition". BBC News. 14 November 2005. Retrieved 3 May 2010. ↑ "Merkel becomes German chancellor". BBC News. 22 November 2005. Retrieved 3 May 2010. ↑ "German coalition poised for power". BBC News. 11 November 2005. Retrieved 3 May 2010. ↑ "Merkel defends German reform plan". BBC News. 12 November 2005. Retrieved 3 May 2010. Wikimedia Commons has media related to 2005 German Federal Election.